George Peppard prepares to take to the skies in The Blue Max. John Guillermin’s 1966 aerial war epic The Blue Max makes its Blu-ray debut from Twilight Time. 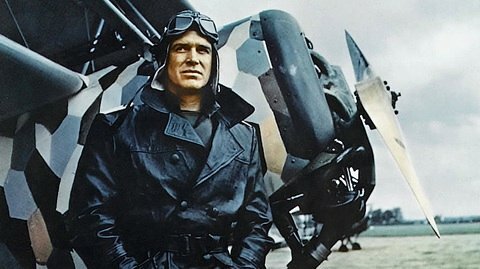 The film stars George Peppard (Breakfast at Tiffany’s) as Lt. Bruno Stachel, an ambitious young German soldier who, from the muck of the World War I trenches, becomes determined to join the aristocratic ranks of his country’s heroic fliers. The film details his journey as he moves up the ladder and into the skies, providing along the way some of the most thrilling sequences of aerial combat ever committed to the screen. Also starring James Mason (Bigger Than Life) and Ursula Andress (The 10th Victim), the sumptuous-looking movie is based upon Jack Hunter’s 1964 novel and features music by Jerry Goldsmith, which is featured on this Twilight Time release as an isolated track. As supplier Twilight Time prints up only 3,000 copies of each title, be prepared to pre-order this one directly from distributor Screen Archives. The prebook date hasn’t been announced yet, but we’re assuming it’ll be in or around early- to mid-January.